I was excited to receive a review copy of this book based on the book trailer, but now that I have it in hand, I have to admit to being underwhelmed. The gimmick is fun at first glance. My kids wanted to hold the book up to the window and see the light shine through the colored circles. It was neat to see the way the images in the center of each page seemed to pop out, and we enjoyed seeing the shadow of the cut-outs on the front cover against our living room floor. After doing all of that just once, however, we'd pretty much exhausted what this book can offer. 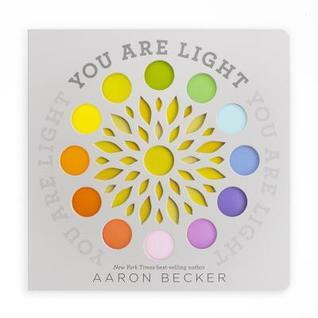 The text is abstract and the "you are the light" message feels empty and sounds more meaningful than it is. The colored circles don't show up on surfaces even when a flashlight is shone right through them, and the patterns made by the empty circles don't seem to signify anything. The book is really just a glorified optical illusion, and frankly, it would be more satisfying to just go out and buy a suncatcher. Sign into Goodreads to see if any of your friends have read You Are Light.